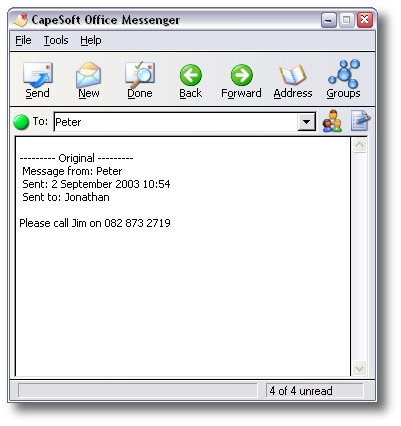 CapeSoft Office Messenger is a peer to peer office instant Messaging program. It's great for sending all sorts of messages instantly to your office colleagues and it's easy enough for everyone to use. We've designed CapeSoft Office Messenger to offer you all the functionality of a high-quality Office Messenging application, while keeping the setup and options to an absolute minimum. This means anyone in your office can use Office Messenger with little or no training required. A must for every office. Вы на учениях или что? Вы курсанты или где?